now scroll till the bottom of the page.....and what do you see?? 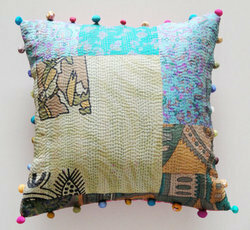 "Anek Design Cushion Images" yes that is right. so this manufacturer by the name of JK Handicrafts is inviting orders and queries by using our product images. 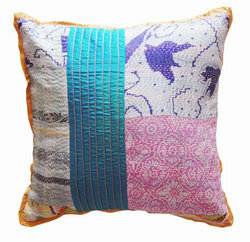 to make it easier for you, here are the cushion images, shot by me, of my products, made in pune, in 100% silk. if you have been a part of our "Anek Designs" journey then you will surely remember these images!! this guy who is obviously a big manufacturer has blindly stolen my images and in the process my products! i find this tragically funny! to top it...these products are displayed not only on his website but also websites like alibaba, hellotrade etc. it doesn't stop here...it gets better. there are more manufacturers who are blindly using our product images on their websites like Balaji Textiles to name a few. 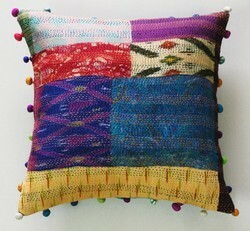 yes i know i do not own kantha, and that the world is using it.....but you know each kantha cushion is unique right? these particular cushions were put together by me,i own these images and worked really hard to shoot them, edit them and then upload them to sell online. it just isn't fair! through this post i wish to reach out to anyone who believes in me to support me and guide me in taking some action against this online theft. 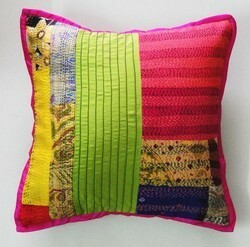 Kanika, have you applied for trademark and copyright for your designs? Unscrupulous manufacturers/traders like these still might steal images, but atleast you can legally sue them. For now, I guess reaching out to the site admins of the trade site might help - they could remove/limit this trader's account. And maybe a legal notice to others will scare them enough to remove the images themselves. Wow, this is so so so disgusting. They even have the nerves to put their own watermark on your images. I have also been a victim to this, where people have copied my paintings and displayed on their own websites. At least they did spend time in making their own painting by copying mine. I think as a precaution - a watermark (big and ugly, yes you heard me say it) will do the trick. I hate to put watermarks, since they spoil the photograph royally. I do not mind putting a copyright symbol/phrase though. I love your works and I hope you are able to take actions against such thefts. I know what it feels like to see people stealing your hard work. Wow, they're just using your images outright. Yes, you must put a watermark on your images and get your copyright stuff sorted out. Till then, they will continue to benefit from your creativity. I can imagine how you feel. Nut let me tell you one thing - maybe it will not console you right now in this moment of anger, but still it's true: they can steal your images, but they can never steal your creativity. Please don't be sad and go on creating your unique and wonderful objects. Only you can give these things to the world. hmmm.....its depressing to see this kanika...its one of the many side effects of going public with our work. I mean, social networking, online shopping is the new age thing, but it also make life for such people so so easy. i personally never watermark my work, coz i hate the look. and besides, how difficult is it for people like these to make the effort of removing the watermark? if they have sunk this low, they will sink lower still! So does this mean that we designers would stop publicising our work online? does this mean we will start compromising on how our product pics look? and sueing them, or having a copyright for these designs will not work in india. you will end up being the victim. There are so many loopholes in design right! Im not sure what the answer to this is, except that we probably keep reviving our work every now and then? these are just a few guys you have caught, who knows how many there are worldwide doing this? will we conduct a witch hunt and take our minds off the real deal, thats designing and putting newer products in the market? you're doing a fine job of what you kanika, dont let these buggers get you down. Bt i do agree with you, its infuriating to say the least! I second Isabella's comment above. And what is yours cannot be stolen. :) And I got to say this, I love the way you have handled this calmly. Take support of other artists, bloggers and take this ahead if you feel like. Let us know if you need support. Last month at Haus Khas in Delhi, I got hold of a garment which was a direct replica of what another fellow designer has successfully created. And this was from one of those export shops. I was shocked. Same textiles (cheap imitation), same buttons, loop...direct replica with a different tag. You cant say much on these things but let it slip. At least you know the product is doing well in the market. However,using your images is preposterous. This is outrageous! Isn't there any strict laws to stop such absurdity!!!!! We sure support you Wholeheartedly dear!!!!!!!! I also suggest watermarks are really really essential! This is a universal problem Kanika. The world is digital today and even with copyrights in place, the laws in India aren't strict enough to punish offenders. Even our site Craftsvilla often suffers from such issues and so is the issue with several other sites. The best that you could do is report to search engines about the apparent theft and or do as Bhavna has suggested. I'm so sorry to see this, it really isn't fair! What you should do is contact the website owner and tell him that the photos are yours (photographers always own the copyright of his own photos unless you've agreed otherwise, which you haven't), and demand him to take the photos off his website. Say that what he has done is illegal. I did this myself when I found heaps of my articles copied and posted on someone else's website. I never said what I would do if he didn't take them off, it wasn't necessary. When you tell people that their actions are illegal, they prefer just deleting your photos and finding someone else's instead of risking any nasty consequences. Ok I want I want I want!! Agree with what Bhavna said earlier. Watermark could also help. Understand its really disgusting to see a direct copy of your own products.